One of the biggest names in world sport, Real Madrid has an estimated fan base of nearly 500 million supporters located all around the globe. Zidane’s stars added yet another Champions League title in 2017, as well as the Spanish Liga. They are the team to beat, although Barcelona were quicker off the blocks this season. 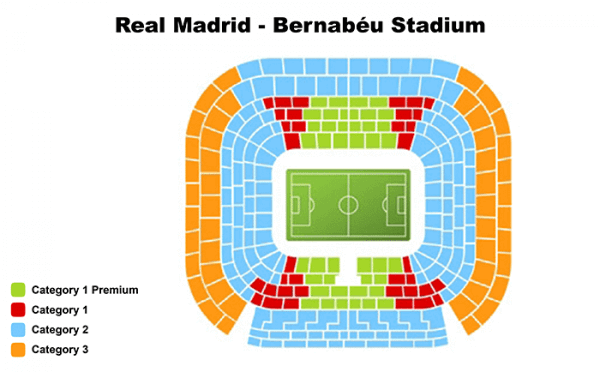 You can obtain Real Madrid match tickets and football packages from the Spain Event. Right at the end of 2017 Real Madrid won the 2017 FIFA World Club Championship, returning in triumph to face El Clasico Rivals FC Barcelona at the Bernabeu Stadium. in yet another clash of Messi v Ronaldo. However the season did not end well for the whites, with Barcelona winning 0-3. Zidane’s stars have their work cut out to close a gap with leaders Barcelona that had widened to 15 points by the end of February 2018. The great news for Real Madrid fans however is the spectacular return to form of Cristiano Ronaldo, meaning that just about anything is possible. Their brand is enhanced with some of football’s most renowned players striving for continued success on the pitch. Home matches are played at the famous Santiago Bernabeu, an all-seated 85,454 capacity stadium located in the northern area of the Spanish capital. Buying Real Madrid tickets for individual games is relatively simple, although the prestigious El Clasico against FC Barcelona and big Champions League games are on the more expensive side. Buying tickets for all of Real Madrid’s home games during the 2017/18 season is easy with The Spain Event. With the La Liga fixtures already announced, you can start planning your Bernabeu experience for the upcoming games straight away. Check out our suggested accommodation, apartments and hotels near the real Madrid stadium. Lower Half, Side View. Your seats will be in the best areas in the lower half of the stadium, side view. One of the following will be marked on your tickets (Spanish language): – Lateral Este or Lateral Oeste (meaning East or West view): Grada Baja, Grada Alta, 1er Anfiteatro or 2º Anfiteatro. Upper Side view, or lower Goal End view. Your seats will either be side view (but higher up than Cat 1) or the best seats of Goal End View. The following will be marked on your ticket: – Lateral Este or Lateral Oeste (meaning East or West view): 3º Anfiteatro or 4º Anfiteatro – Fondo Norte or Fondo Sur (meaning North or South Goal End): Grada Baja, Grada Alta, 1er Anfiteatro or 2º Anfiteatro. Upper End View (higher up than the Cat 2 end view seats). The following will be marked on your tickets: – Fondo Norte or Fondo Sur (meaning North or South Goal End): 3º Anfiteatro or 4º Anfiteatro.